After eating breakfast and packing up our camps, Bob and I left the Chester park at around 8:30 in the morning. Given that Bob is the fastest rider I've come across so far, and I'm one of the slowest, it was perhaps a little foolhardy to attempt to ride together. Nonetheless, we decided to give it a go and we headed out with the city of Farmington in mind as our destination for the day. 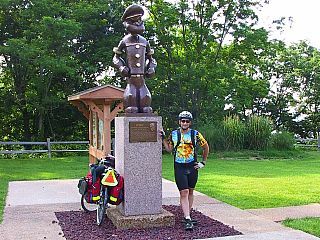 As we left Chester we rode along the Mississippi river, stopped at the statue that celebrates Chester as the birthplace of Popeye, then crossed over the river into Missouri. 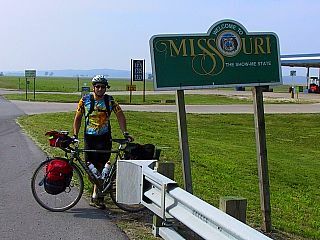 The primary feature of Missouri that concerns cyclists is the Ozark Mountains, generally considered to be second only to the Appalachians in difficulty on this route. Bob and I were pretty evenly matched on all the flats we rode, but I was clearly outmatched every time we came to a hill to climb. It appears that, despite what one would expect, the last twelve years I have spent with a desk job haven't prepared me as well as his history of soldiering, rock climbing, and kayaking. I did have the advantage that my bike allowed me to take the descents faster than his did, so on average I didn't fall too far behind during most of the morning. As Bob and I stopped for an early lunch in the small town of Ozora we learned that the temperature for the day was pushing 95 degrees. Missouri was bidding us welcome with heat, humidity, and hills. Despite this, as chatted over lunch, Bob announced that he was leaning towards making it another 90-mile day for himself. We planned to ride as far as Farmington together where I would mull over pushing further and he would make his mind for himself. But as our ride led us over hill after hill, Bob slipped further and further ahead of me. Eventually he rode out of sight and I haven't seen him since. Each of us is free to decide for themselves what sort of trip they want this to be, but I know I wouldn't be enjoying myself anywhere near as much if I pushed myself at Bob's pace. Shortly after arriving in Farmington I ran into Joseph Moll, whom I had first met in Carbondale on the 29th. Although Joe was camped in one of the city parks, he told me that he had learned that the mayor and his wife welcomed cyclists into their home. Not one to look a gift horse in the mouth I gave the mayor a ring and was told they would be happy to have me. Kevin and Christiane Engler reminded me of the proverbial high-school quarterback and head cheerleader sweethearts, only all grown up. Kevin had the build of a WWF wrestler, and Christiane runs marathons and triathlons. Their house was a whirlwind of activity, with their daughter and three sons coming and going. Before I knew it I had been offered a place to sleep, a shower, a dip in the pool, and a freshly cooked steak. I couldn't help thinking that Bob had missed out, but maybe I don't appreciate the beauty of pumping out 90-mile days. After dinner I hopped in the mayor's truck and Kevin gave me a partial tour of his town. As we drove by the hospital and the water park I had to admit I was impressed with the quantity and quality of facilities that Farmington offers for a city of its size. Kevin made it sound like it was the most perfect place to live in America, and his pride in his city was visible. Apparently, the citizens feel somewhat the same towards him as one of the final things he showed me was the newly built "Engler Park". That evening, I asked Kevin if there was any special plug he wanted me to give Farmington. He joked, "Just say that it has one hell of a mayor". Given that you can't fight City Hall, I guess I'll just close with that.